You are here: Home / Weekly Columns / Opinion / This Is How the Xbox Adaptive Controller Works. This Is How the Xbox Adaptive Controller Works. (ThyBlackMan.com) Microsoft has finally unveiled its Xbox Adaptive Controller which is primarily designed for video game players with limited mobility. In the product’s launch video, you can see people with disabilities enjoying video games in many ways, and if you’re wondering how the Xbox Adaptive Controller works, here’s everything you should know. The launch of the Xbox Adaptive Controller is heartwarming, particularly for those who have friends or family members with disabilities. The Adaptive Controller comes in a rectangular shape with two large buttons, a D-pad, profile, view, and menu buttons. On the controller’s edges, you can see 3.5mm jacks and USB ports for assistive devices. Microsoft uses the term “limited portability” for the target customers and with that, the company targets a huge player base. The controls are completely customizable and with two large buttons on the front and support for other devices, players can easily set up the controller based on their specific needs. In simple terms, users can add third-party hardware and button controls through the Xbox Adaptive Controller’s 3.5mm jack and USB ports. There are many gaming accessories available for people with special needs. Microsoft’s Adaptive Controller lets you easily use large buttons, floor pedals, and almost anything else that helps gamers control their games. Players who can use one hand or no hands can also play games using it. Other solutions available in this area often require players to get involved in too much technical stuff. Too many wires and technical expertise were a big disappointment for gamers with special needs. At the same time, the cost of custom-made solutions made it nearly impossible for gamers to enjoy their games. 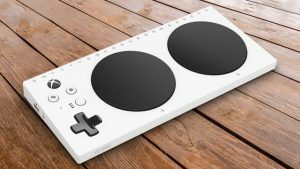 The two large buttons on the Xbox Adaptive Controller lets players configure the buttons in the way they want. These buttons are large enough to allow players to control the game using hands, fingers, feet, and elbow making it easier for them to set controls as per their specific needs. The rear edge of the controller has many 3.5mm jacks for input devices and buttons. This functionality allows players to use traditional controller setup in a more personalized way. For instance, if a player is unable to control games using their hands, they can add a foot pedal using one of these ports. For people who need touch-sensitive control buttons or other devices, these ports can be used to connect the hardware of their choice. Quadriplegic players use quad sticks which can be operated using the mouth. The best thing about the Xbox Adaptive Controller is that it is completely wireless and the only wired connections players will need are the devices they are adding for a gaming experience tailored to them. The controller sports a USB-C charging port and it also supports an active power supply to help players connect add-on devices that need an operational power supply. For instance, a player using quad stick can just sip and puff to use the power their device needs. Microsoft’s Xbox Adaptive Controller supports the company’s consoles and Windows 10 PCs. So players using any of these devices can easily connect the controller to their gaming system. During an interview, Microsoft’s executive vice-president of Gaming Phil Spencer said that the company is open to allow anyone who wants to learn from its technology as the product is not designed with competitiveness in mind. He said it’s not about Sony, Nintendo or Microsoft, the core idea behind the adaptive controller is to include people who always wanted to be a part of the growing video game community but couldn’t do so due to their limited mobility. The Xbox One Adaptive controller is now available for $99.99. The device supports many accessories including wheelchair arm mount, leg mount, joystick, foot controller and switches designed for players with a disability. The controller also supports table and wall mounts if players need any such functionality. Maybe something I shall use in the future.